Entrepreneurial Small Business 3 Edition Entrepreneurial Small Business (ESB) provides students with a clear vision of small business as it really is today. 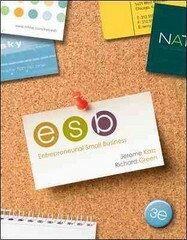 It focuses on the distinctive nature of small businesses that students might actually start versus high growth firms. The goal of the companies described in this textbook is personal independence with financial security; not market dominance with extreme wealth. Traditional beliefs and models in small business are discussed, as well as the latest findings and best practices from academic and consulting arenas. Katz and Green recognize the distinction between entrepreneurs who aim to start the successor to Amazon.com and the pizza place around the corner. They discuss the challenges facing entrepreneurs, while keeping focused on the small businesses students plan to start.